Find the best deals on Douro wines available now on the UK market. Compare current prices and redeem our exclusive vouchers. Use various search filters to find your perfect pick. Look at reviews, awards and Price History to find the right price-quality balance. Sign up to Price Alerts and we will email you when your favourite bottle goes on sale. One of the most majestic wine regions in the world, and home to one of the 2 most famous and world class fortified wines, Port. It’s a wild, rugged land, still relatively remote, despite improved road connections and hotels over recent years, and a place of simply staggering beauty. 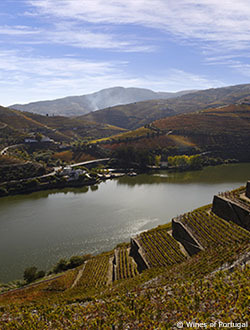 The steep, terraced vineyards, clinging to the sheer, schist and slate soils, rise imperiously above the river Douro, which begins its journey as the Spanish river Duero. Traditionally, and still, the home of Port, it is only in relatively recent years, that the Douro region has come to prominence for the production of some very serious, top notch table wines, largely based on the same grape varieties used in Port production, Touriga Nacional, Touriga Francisca, Tinta Roriz and also some influence from Cabernet Sauvignon and other international grape varieties. The Douro region is naturally split into 3 areas, the upper, the middle and the lower Douro. The middle Douro (Cima Corgo) based around the town of Pinhao, is where the majority of the Port production is based, with this part of the Douro producing over half the total wine production. This is where the iconic Port estates, or quintas, are housed, nestled in the splendid isolation and peace of the vineyards. The lower Douro (Baixa Corgo) has traditionally produced most of the table wine, on the lower, easier to reach slopes, however more wine is now being produced on the steep slopes of the middle Douro and also the upper Douro, wines that are more premium partly because of the difficult nature of growing and harvesting the grapes. In recent years, there has been much development in the hard, high, remote area of the Douro Superior, with pioneers, planting vineyards that would not have been there 10 years ago. It’s an area that is relatively undiscovered, only accounts for 20% of the Douro land, hard to get to, and a struggle to work, in terms of vineyards – but the low yields, and the stressed vines, make for some superb, intense, complex reds.